MICHAEL MILLER: That is a difficult subject to be objective about since technology is so prevalent that many do not even pursue reading of any sort. Modern education seems content to lend itself to fields that will only intensify areas that do not further inner reflection and character. Poetry is as much a view into ones heart as it is a stimulus for further inspection into every field of exploration. MICHAEL MILLER: I do not fabricate or create myself, I have always written when driven by the lens of love. I neither craft nor research, I write down what is given to me, then I reflect and edit. MICHAEL MILLER: I wish, my night dreams are rarely good or comfortable. My own thoughts awake are like wild horses which are difficult to keep a bridle on. A friend calls it “channeling” and I am always surprised by the subject matter taken by the pen. MICHAEL MILLER: The character of mankind and the religions that influence the thoughts and activities of those governed by them. The study of empires and history is a great revealing of how religion has impacted the formation of societies and how human avarice has been greatly increased by the prevailing beliefs. Don’t ask me how they enter into the writing part, I have no cogent explanation for how the subjects enter into the “art of poetry” since my primary studies are in science , history , and theology. I don’t know how inspiration works or why I just sit down and “write it” . MICHAEL MILLER: Always the lens of Love, from the perspective of the how humans were designed to exist and yet do not excel even in our own highest ideals. At least that is where I tend consider life in my preview. MICHAEL MILLER: No, I’ve never pursued it as many do, so yes by chance and always only when “driven”. MICHAEL MILLER: Only to my children, and rarely even then. It has always been a very private subject. I only started sharing them when pushed by my children to join facebook and share them. Otherwise they would still only be in a personal journal. MICHAEL MILLER: I did have the majority copyrighted and had some offers from record companies , but no I have not pursued that since I am not looking for income or adulation of any kind , as I mentioned I would not have shared except under pressure from my progeny. 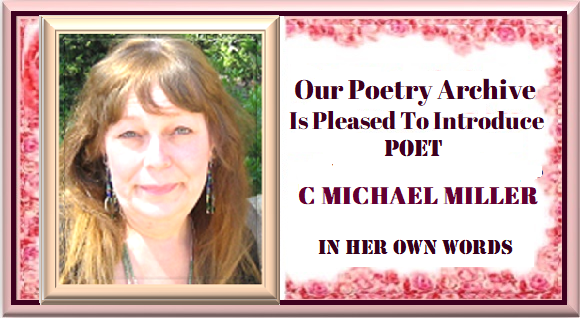 MICHAEL MILLER: My preference in poetry reading is quite for the ancients and while I have read works from Ovid to Rumi and Khayyam. I rarely pursue that sort of reading. A major portion of my time is given to history, science and theology and I tend to explore fields for a time then bounce on to the next subject to learn about. The last three years have been given to taking a multitude of history courses and archeology. When I am done with that, it will be on to something new to explore. So I am unsure if I will continue to write since I am now onto new explorations. MICHAEL MILLER: It has been apparent that those who have read what comes off the pen find them very clear as to subject when they have taken the time to comment. This said, Christian theology is filled with symbolism and I think some of that has infiltrated many of the pieces. I do not spend time analyzing them that would be for those who read since I otherwise would not have made them for public view except with the pressure from my children. MICHAEL MILLER: I have taken the time to gather them into particular collections and yes there are definite themes, mostly based on our human character and our beliefs and how they are expressed in our day to day lives. I feel mostly that it has been for my own learning about who I am and how I think, about my past, our past, and our future selves. The formation of character and the examination of human traits and how they affect our relationships in their entirety. MICHAEL MILLER: No , human character is strictly neutral as to gender and subjects such as love , loyalty , justice, understanding wisdom, knowledge , compassion , mercy and forgiveness should be inclusive into both genders and taught starting from the point of the ability to speak (subjects that should be instilled from the earliest age to understand) There are a few pieces that are very personal but applied to human experience would cover either gender as we all have been affected by the actions of others or our own upon others . Some of us learn from them, since we all repeatedly make many faux pas in the course of life lessons. MICHAEL MILLER: It would be difficult to separate self , from the same source that affects the issues of mankind , so any examination of character would apply equally to myself as it would to anyone else , providing our “belief” that the above subjects should apply to every single human being . MICHAEL MILLER: I do not think so much that it is. I have spent very little time examining modern works though. Much of the poetry in ages past have much the same themes of daily life though the expression might be couched in other words, unless you separate the theological works. MICHAEL MILLER: That might be better left to those who feel they are qualified to be a critic. I personally do not , nor would I feel qualified to teach on the subject since it has not been a “lifetime” pursuit . Those of us who regularly meddle with or explore subjects outside of the tradition left to us by institutions would rarely be of interest to those who consider themselves so erudite. MICHAEL MILLER: Human understanding is thought to start with pictures. From the external to the internal, from vision to mind , from fact to symbolism , yes . Even science wants to express itself by images to aid our understanding , molecular biology is frequently “pictured”with diagrams along with the discussion of how it works to better aid our understanding . Does a cell actually look like the picture in the book, yes imagery is very important to human understanding. I do believe this would apply to poetry as well as every other subject explored. MICHAEL MILLER: Same as most places I think. Poets tend to be expressive of all the human considerations and tend to be sensitive to them. But that may be my own personal thoughts. Having been connected to your publication for a few years now and it having a very international involvement I have found many tend to consider the same subjects we all do regarding life and its lessons or resistance to its lessons. MICHAEL MILLER: Ahhh, I do not know that answer . I only know what I have enjoyed and what I have not. MICHAEL MILLER: Since I do not spend much time in modernity, except by way of existence, that would be difficult to express. My considerations have much to do with the whole of history and mankind and since we cannot study the future except in a theological sense to extrapolate what humans tend to do I tend to spend my time studying the past. I have had no relative interest in “modern poetry” per se. MICHAEL MILLER: Human understanding and character, or the lack of it seems to run the threads of those pieces. If so, then my internal vision has a mind of its own since I daily fail even my highest ideals. They seem pretty idealistic in the face of my daily realities. MICHAEL MILLER: Generally it makes me pretty self introspective by comparison to the themes of what is written. Makes me aware of my flaws and the need to seek a great deal more understanding and apply it more actively. MICHAEL MILLER: Understanding is the speaker. I feel that it is to me it is speaking. If it speaks to others I can only say by those who have made comments in the past , so at the least many “see” what the work sees. MICHAEL MILLER: That seems pretty extensive. Our failures to live up to what we idealize and how that affects each other and the need for continued pursuit to incorporate them into our very own natures. MICHAEL MILLER: Your publication increased the reading by the thousands last year on G+ . I do not know if its successful or meaningful to others , as stated previously I have never written “for the public” nor do I intend to start doing so. No one saw them for thirty something years except my children, I am not likely to change that though I have shared them by request. MICHAEL MILLER:: OPA has been a wonderful journal of international contributors. It has been a means to see so many of us think upon the same subjects.